This project ended successfully on 13/4/2017 19:00! «yamo cooler bag» Want something warm to drink in summer? We didn’t think so. That’s why you will receive our cool (quite fitting, right?) insulating yamo cooler bag for the BBQ season. The hipsters on your block will be green with envy! «Early bird discovery box» (Pur)Ay Caramba, your curiosity deserves a reward! We will send you our variety of seven delicious baby food creations – directly to your home, and we will throw in a cool yamo cooler bag, equipped with a practical cooling element! Save more than a total of 13.- Swiss francs! «Starterpackage (5+ months)» For all gourmets after the 4th Month! We have the appropriate nutrients for the right age. Twelve little cups and the cool yamo cooler bag with its practical cooling element will be delivered directly to your home. Save more than a total of 10.- Swiss francs! «Starterpackage (7+ months)» For all gourmets after the 6th month! We have the appropriate nutrients for the right age. Twelve little cups and the cool yamo cooler bag with its practical cooling element will be delivered directly to your home. Save more than a total of 10.- Swiss francs! «Starterpackage (9+ months)» For all gourmets after the 8th month! We have the appropriate nutrients for the right age. Twelve little cups and the cool yamo cooler bag with its practical cooling element will be delivered directly to your home. Save more than a total of 10.- Swiss francs! «Office Party» We are pleased to welcome you to our office party where tasty hors d’oeuvres await you, served with cold hops tea and baby food à discretion. We will show you our office and share our secrets with you. Of course, you can take an exquisite selection of our finest yamo baby food home with you in our cool yamo cooler bag. The party takes place at 7pm after work on Friday, 9 June, 2017. «yamo voucher» Have you recently become a godmother or godfather, or are you looking for the perfect present? Give a gift of vitamins and your time. Contribute 100.- Swiss francs and receive a voucher for the yamo online shop with a value of 120.- Swiss francs. Olé! «yamo Box (5+ months)» A baby food trio! The yamo box for after the 4th month sent to your home 3 times. You will receive 3 deliveries of 12 little cups (every 2nd week), and the cool yamo cooler bag with its practical cooling element will be delivered directly to your home the first time. Save more than a total of 20.- Swiss francs. Yay! «yamo Box (7+ months)» A baby food trio! The yamo box for after the 6th month sent to your home 3 times. You will receive 3 deliveries of 16 little cups (every 2nd week), and the cool yamo cooler bag with its practical cooling element will be delivered directly to your home the first time. Save more than a total of 30.- Swiss francs. Yay! «yamo Box (9+ months)» A baby food trio! The yamo box for after the 8th month sent to your home 3 times. You will receive 3 deliveries of 20 little cups (every 2nd week), and the cool yamo cooler bag with its practical cooling element will be delivered directly to your home the first time. Save more than a total of 40.- Swiss francs. Yay! «VIP Musical tickets and Meet&Greet with Fabienne Louves» Besides baby food, you also have a passion for music and a great show? Then we have something for you! You will receive 2 VIP tickets for a musical with star singer Fabienne Louves and get to meet her at a personal meet & greet! You can look forward to a great crime story musical! Of course, there is an exquisite selection of the finest yamo baby food for you to take home in our cool yamo cooler bag. «Family nutrition crash course» You need a crash course on the topic of healthy eating habits for families with children? Our nutritionist Stefanie will teach you everything you need to know. Grocery shopping, cooking and baking with children will no longer be a nightmare! Of course, you can take home an exquisite selection of the finest yamo baby food in our cool yamo cooler bag. The course takes place in Zurich on Saturday 17 June at 1pm. The exact location will be announced by email. «Personal nutrition & fitness consultation» Get fit for summer! Our nutritionist and personal trainer Stefanie Bürge will get you back into shape. You will receive a diet plan, including requirement calculations and control coaching, made to measure for your daily routine and your goals. In addition, she will develop an individual training plan together with you to strengthen your muscles, posture and mobility. You will receive six hours of individual nutritional advice and fitness coaching for only 500.- Swiss francs instead of 780.- Swiss francs! «yamo shop listing» You would like to sell yamo products at your own shop? For 800.- Swiss francs, you will receive yamo baby food with a value of 1000.- Swiss francs, and we will advertise for you via all yamo channels. «Your own yamo special edition» Develop your own yamo special edition for your baby together with us. You choose the flavor. Plus, you get to design the packaging of your special edition with the agency. For one whole year, we will send you your own fresh baby food every two weeks, until it starts coming out of your ears. «Farmer visit in Ecuador» We buy our raw ingredients from regional organic suppliers, but bananas and mangos unfortunately don’t grow in Switzerland yet, so these tropical fruits come from beautiful Ecuador. We will take you on a 10-day trip there to visit local farmers and learn everything about the cultivation of organic fruits and fair trade. Travel expenses, room and board are included. In the mood for a holiday? The trip will take place in January 2018. «yamo business angel» You have a burning passion for start-ups, you like to support them with your expertise, you see particular potential in our idea and have a few extra Swiss francs in your pocket? We offer you a permanent spot for life at the side of our founder team. You will be involved in every important decision in the future and, of course, take part in every company event. Plus, you will receive a monthly status update on the progress of the business and yamo à discretion a lifetime long. YEAH! 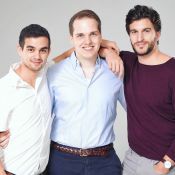 We’re Tobias, José und Luca, the three founders of yamo, the freshest organic babyfood from Switzerland. And together with you, we’d like to support parents of young children with a fresh and natural alternative to preparing babyfood themselves with much effort. For that, we use a new technology that preserves vitamins, and we only select the best organic ingredients. Join the babyfood revolution!